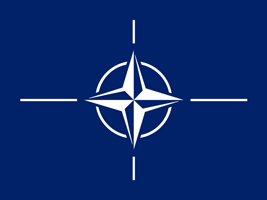 The flag of the North Atlantic Treaty Organization consists of a dark blue field charged with the emblem of the organization in white, that consists of a compass in a circle, with four white lines radiating from the four cardinal directions. It was adopted on 14 October 1953. From 5 October 1951 the Alliance used the flag of the Supreme Headquarters Allied Powers Europe (SHAPE), that consists of a green field with the coat of arms of SHAPE, which General Dwight D. Eisenhower helped design it. But, in August 1952 the newly formed Information Policy Working Group concluded the necessity of adopting a visual symbol that would best represent the values of the Alliance and thus recommended to the Council to adopt a flag and emblem. The dark blue color represents the Atlantic Ocean, the compass symbolizes the direction towards the path of peace as the main strive of the member countries, while the circle stands for the unity that binds them together.